Even with the sails are lowered, I’m sure the Skytanic still cuts through the wind with incredible speed. Whether you are on the deck or inside the ship, it looks like there are plenty of excellent viewing areas. 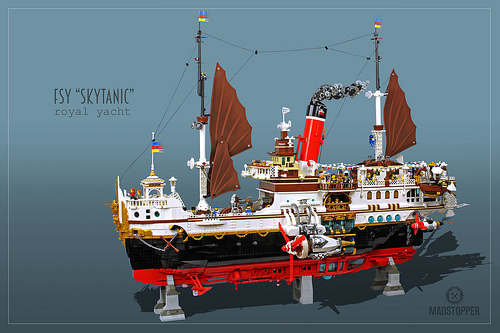 I really enjoy the way the gold bricks flow upward to form the figurehead on Skytanic’s bow. If you are wondering what those little round windows are, they’re made from the panel 4x3x3 with porthole that first appeared in the 1997 Divers theme. Had I been working on a steampunk build, I don’t know if I would have ever thought to use them. Here, these pieces add to Skytanic’s overall character. From this angle, side-mounted propellers look pretty imposing. If you look at the previous pictures, you will notice a little boat named the FSS Sparrow. 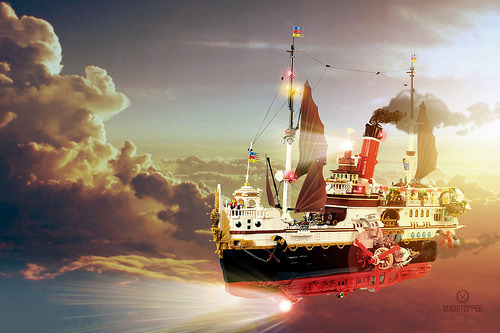 In Markus’ story, the Sparrow ferried these passengers from Maersk Pier to the Skytanic. 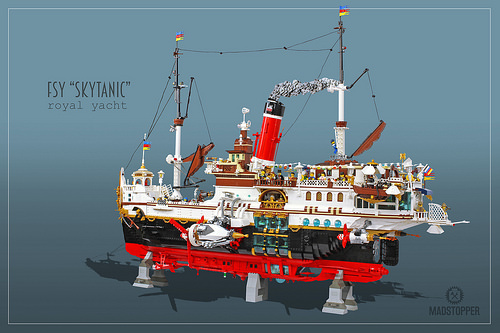 When docked alongside Skytanic, I imagine it also doubles as a lifeboat. By itself, it’s certainly inadequate for the number of passengers on board, and given the homage to Titanic, I have a feeling this might not end well… What will happen next? Stay tuned, because Markus has more steampunk builds on the horizon! 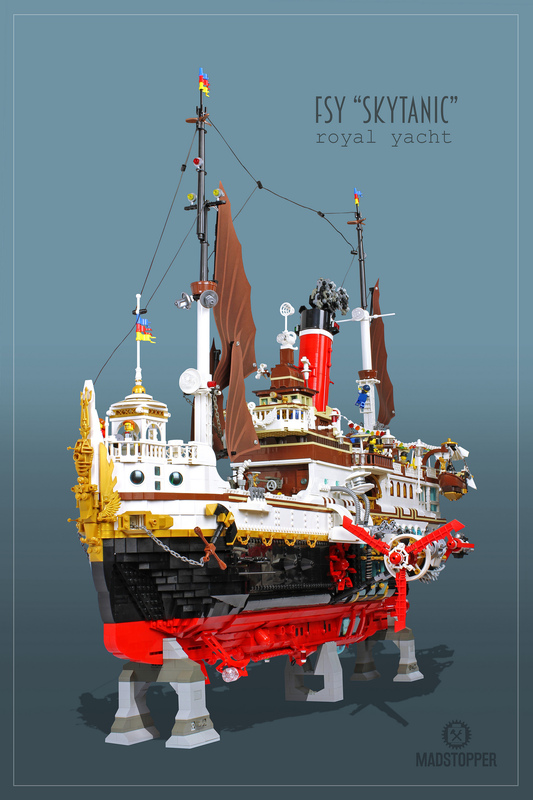 Be sure to check out Markus’ incredible Steampunk Maersk Pier that accompanies this huge ship. I was actually just look at some of Marcus’s builds last week. He’s definitely being inspired building in this theme and it’s a real pleasure to peruse.